I walk five miles in 50 minutes every morning, carrying the two-pound hand weights. I have heard this burns 40% more calories. How many extra calories do I burn walking with hand weights? If you are walking ten-minute miles you are burning a heck of a lot of calories. For most people, moving faster than 12 minutes per mile requires quite a bit of effort – more effort, even, than slow running. But I can’t estimate calorie burn without knowing your weight. You can use the burn calculator to determine this for yourself. 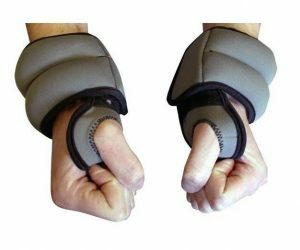 Also, it depends a lot on what you are doing with your hand weights – whether you are just holding them at your side or pumping them vigorously. I do not recommend walking with hand weights as it can be very hard on the joints and tendons and cause inflammation. I recommend lifting weights separately. If you walk, I consider it is enough effort you make and in this time you loose enough calories!